We're a virtual company made up of tech experts from across the globe. The majority of our work is also done from a home office, where a NAS comes in handy. We've tried both of these OSs and know just how similar they are. DSM is an incredible feat of computer wizardry and is an absolute breeze to use. The only issue is that certain features require an app, instead of being baked into the main control panel. Works just like a mainstream desktop OS. Can't copy and paste files between PC. If you prefer a more smartphone-esque look to your operating system, you may want to try out QTS, which has similar drawbacks to DSM. Takes advantage of the more powerful hardware. I've spent extended periods of time with both operating systems. QNAP's QTS and Synology's DSM are two great software options for a NAS. Choosing a NAS for the home or office shouldn't really be determined by the OS unless you have a personal preference. It's difficult to point out what either OS does better (or worse) because they're similar in many ways and can do everything you need a NAS to do. You need the system to power on, have the basic features included to manage installed drives and configure settings, as well as provide support for third-party services and apps. Both companies have worked hard to make sure the installation of a new NAS and management once you're up and running is painless. Synology used to have the edge, but now the two competitors are neck-in-neck thanks to recent advancements made by QNAP. You're comparing two very similar software offerings. 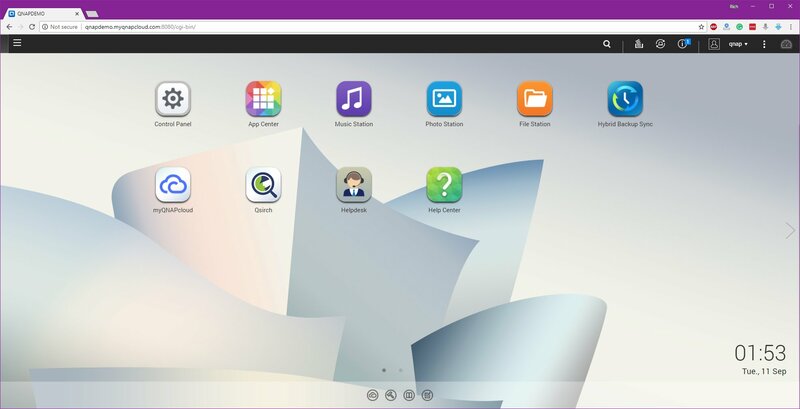 You'll find a number of apps and features present in both DSM and QTS, including cloud synchronization, file storage, smartphone connectivity, and the installation of popular third-party apps and services. Everything you'd need is present, including the simple ability to create user accounts and a more advanced method of turning the NAS into a media server. It's not all positive, however. One feature which I'm sure some users would like to see with both operating systems is the ability to simply copy and paste files between a PC and the browser window, but focusing on that is being picky. While the choice is largely down to which you prefer the look of, Synology still edges ahead in my mind with the complete package. Synology has always been ahead and has only just started to feel threatened by QNAP, which is great news for fans of both companies. DSM continues to make strides in usefulness without clogging up the interface and in general, it just works. Ideal if you're buying your first NAS. The DSM is one of Synology's major selling points for its collection of NAS models. It's easy to use and does everything you need the NAS to do. When you need a little more (much like comparing a Synology NAS to QNAP) you should opt for QTS, which can take full advantage of the more powerful hardware. This allows you to do certain tasks a little faster, but the OS is just as good as DSM. There are no major flaws that I'm aware of. Backed by more powerful hardware. QNAP software isn't in a different league to Synology, but the better hardware does make a difference when you're trying to do more intense tasks.